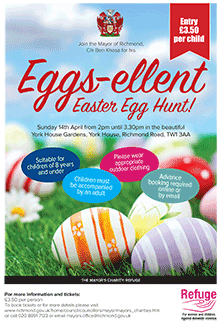 Join the Mayor’s Easter Egg Hunt at York House | WHATSLOOKING! The Mayor, along with some supporters, is taking part in the Thames Sky Dive fundraiser for the Mayor’s charity Refuge Richmond, who work with people in the borough who are experiencing or have experienced domestic violence or domestic abuse. Join the Mayor of Richmond for a fun Easter Egg Hunt around the beautiful York House Gardens. Each child will be given a fun gamecard which they must complete in order to win their prize! Unfortunately we have had to cancel the Murder Mystery evening (Friday 5 April). Despite extensive marketing and publicity for the event, ticket sales were low and we needed a minimum number of people to attend to ensure that the event still raised vital funds for the Mayoral charity. Our apologies to all those who purchased tickets and we will be contacting everyone to ensure that their ticket price is refunded. Hopefully all will be able to join us for Mayoral events in the future.